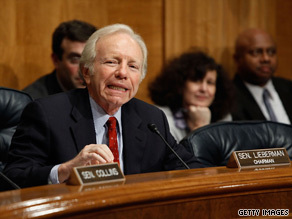 Sen. Lieberman said Tuesday that he opposes any kind of public health insurance option. WASHINGTON (CNN) - Sen. Joe Lieberman told reporters Tuesday that he will support Senate Majority Leader Harry Reid on a procedural motion in order to start the health care debate - but opposes any kind of public option, including state opt-out and trigger provisions, and will ultimately not vote to approve any health care bill that includes any version of a public option. The announcement means that even if Reid is able to get a measure introducing a public option that allows states to opt out onto the Senate floor for debate, Lieberman - who caucuses with the Democrats - won't provide a crucial vote needed to get it off the floor and up for a final vote. "I am strongly inclined, and I have had this conversation with Sen. Reid several times, to vote for the motion to proceed to take up the bill. Why? Because I want to vote for health care reform legislation, so I'd like the debate to begin," said the Connecticut senator. "But I've also made clear to Sen. Reid that if the bill remains as it is now, I will vote against cloture, to finish the bill and pass it affirmatively." Lieberman said the inclusion of an opt-out provision would not change his position. "To me, the opt out doesn't change the basic facts. The last thing we want to do now is create another Washington-run health insurance company," he said. "There's enough good things that we're talking about - health care delivery reforms, insurance market reforms, extending coverage to people who don't have it now. I think we're just asking for trouble that the taxpayers don't need. I think the end result of it - I mean we are having enough time sustaining Medicare." The Democrat-turned-independent said he could not support the creation of a public option because "it still creates a whole new government created entitlement program for which taxpayers will be on the line." "I can't see a way in which I can vote for cloture on any bill that contained a creation of a government-operated-and-run insurance company, it's just asking for trouble," he said. He also rejected the idea of a "trigger" option that would allow for the launch of a new public option if the insurance industry failed to meet certain coverage benchmarks. "I feel this way about a national government-run health insurance company whether it's a trigger or not," he said. Who is this Lieberman fellow and why is he relevant? Sounds like a lapdog to me. Reid is pushing this to shore up the radical left to fend off a challenge in Nevada. He doesn't give a sh!t about a public option, only himself. Newsflash, hypocrite! Republicans are vocal advocates of Medicare and are even whining in case it gets reduced in any way, and Medicare IS a government-run, taxpayer paid program! And all these politicians are themselves getting subsidies for thei health care through the government. (i.e. more taxpayer dollars) So if you don't like government programs then give up your own share too! Oh, and along with that why not give up Social Security, police and fire services, public roads, clean water, and our much touted military too! Those too are government-run programs! Yes, I'm sure we'd be so much better off when the nation's security will be provided by a for-profit corporation who decides whether to protect us on whether we can pay their surcharges! He will vote for public option if Obama start war with Iran for Israel.